President Macky Sall of Senegal launches a new Regional Scholarship and Innovative Fund in Johannesburg, South Africa, in June 2015. 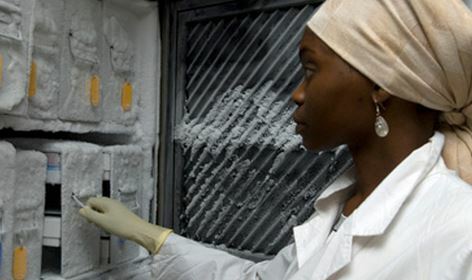 $5 million committed by African governments and African Business Champions for Science to award 10,000 PhDs scholarships over ten years. The Fund is an initiative under the World Bank’s ‘Partnership for Skills in Applied Sciences, Engineering and Technology (PASET)’ program. A high-level gathering including H.E. President Macky Sall of Senegal and government and business representatives from several African countries, met to discuss greater support for Africa’s skills needs. President Sall officially launched the Regional Scholarship and Innovative fund on June 13, 2015, with initial seed money of US$5 million contributed by African governments. The Fund is a key initiative under the Partnership for Skills in Applied Sciences, Engineering and Technology (PASET), which is facilitated by the World Bank Group. “Increasingly, Africa sees the need to depend on science and technology to increase industrial and agricultural productivity, guarantee food security, tackle diseases, ensure a safe water supply, and reduce the energy deficit,” said President Sall. The three founding member countries of PASET were represented at the event by Senegal’s Minister of Education and Research, Mary Teuw Niane, Rwanda’s Minister of Foreign Affairs, Louise Mushikiwabo, and Ethiopia’s Minister of Education, Shiferaw Shigutie. Today, Africa faces a dire deficit in skilled workers in the applied sciences, engineering and technology (ASET) fields. There is one or less scientist or engineer per 10,000 people, compared with 20 to 50 in industrialized countries. African business leaders have long been concerned about the skills mismatch in the labor force. Due to a lack of the relevant expertise and skills, African businesses have preferred to invest outside of the region, and external investors in Africa continue to import skilled workers. Emerging economies including China, Brazil, India and South Korea faced similar challenges in their early years until they invested heavily in science and technology education and research. The $5 million pledged by African governments is an initial contribution to seed the Regional Scholarship and Innovation Fund, which will train 10,000 PhDs, building research capacity in African universities and promoting innovation and entrepreneurship in ASET fields in Africa, over a period of 10 years. Leaders agreed to operationalize the Fund by June 2016, with a transparent, accountable and results-focused governance structure. Sub-Saharan Africa needs an innovative ASET workforce that can provide sustainable solutions to Africa’s challenges in priority sectors, such as agriculture, energy, construction, manufacturing, transport, financial services, tourism and health. This would develop new knowledge, products and processes and adapt existing technology into marketable goods and services customized the African context. Creating this workforce requires improvements in the quality of university faculty and the development of relevant and quality curricula that encourage innovation, and investment in research capacity building. Africa is on the cusp of a socio-economic transformation. To accelerate this transformation requires a paradigm shift in three respects: a regional approach which complements individual country efforts in specific areas of development; public and private sector partnerships; and strong ownership and leadership of the change process by African stakeholders. The launch of the Fund was a simple but very unique gathering that exemplified this paradigm shift. A few champions took the initiative to build a critical mass of highly skilled scientists and technologists. Using a regional effort which pools public and private resources to build capacity on the continent, they invited other African governments and business leaders to make similar commitments. As this Fund and its parent initiative, PASET, take deeper roots within sub-Saharan Africa, it is hoped that many other African governments, business leaders, and partner institutions will take up the challenge and support the partnership.